After beating BJ Penn and leapfrogging back into a welterweight title fight against UFC champion Georges St-Pierre, most would think Nick Diaz (Pictured) would be pleased with what transpired at UFC 137. 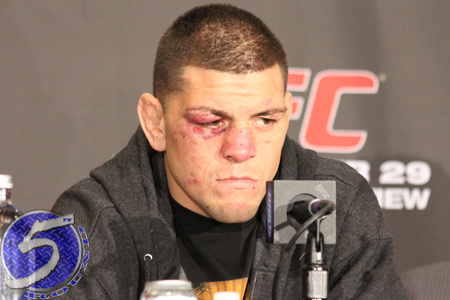 However, Mr. 209 was sporting quite the scowl throughout most of the post-fight press conference. “I’m not happy with my performance at all,” Diaz flatly stated. “I wasn’t 100 percent [Saturday]. I felt good, just leading up to this fight, I went through a lot of hard times. When asked to expand upon the harsh criticism he inflicted on himself, Diaz claimed his face wouldn’t be nearly as bloodied and battered if he had access to the proper training partners. “I didn’t have any sort of workouts like I have had in the past,” Diaz shared. “I don’t take punches like that when I’m working out with guys like Andre Ward and the guys even that are working out with Andre Ward. That’s when the topic of conversation quickly turned towards the greens. No, not the sticky-icky. Diaz pinpointed money as the reason he wasn’t able to formulate the ideal training camp for Penn. When Ward was forced to bow out of Diaz’s camp after suffering a cut, the current WBA Super World Super Middleweight champ’s fellow boxing buddies were demanding far too much money to spar with Diaz. “They’re not taking care of me because they’re not compensated,” Diaz professed. “They’re not getting paid like they should. My sparring partners, they’re not getting paid like they should. That’s why nobody wants any part of this. Diaz didn’t mention how he intends to tackle the issue in his preparations for St-Pierre. Speaking of GSP, although you could tell he was more animated after UFC president Dana White dubbed him the division’s new top contender, Diaz still wasn’t willing to crack a smile. “See how I’ve got to come off just to get a fight?” an agitated Diaz stated. “I’ve got to come off like that just to get a fight. I’ve got to be the bad guy. Diaz is slated to challenge St-Pierre for his throne on Super Bowl Saturday.